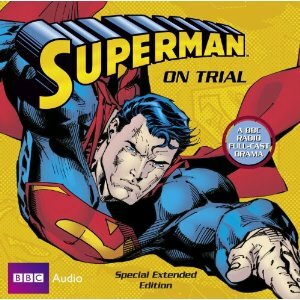 Distributed by BBC (British Broadcasting Corporation) on cassette and CD, but originally airing on BBC Radio 1 FM in the late 80s and early 90s, Superman on Trial, The Adventures of Superman and Doomsday and Beyond are three brilliantly produced Superman radio programs. Superman on Trial was broadcast by the BBC on the 1st September 1988, in an original adventure in which Superman was put on trial by the Guardians of the Galaxy for interfering in the destiny of humankind. It was notable for the odd revelation to the world that Superman had been brought up as Clark Kent's brother (a lie brought about by certain disclosures during the trial), and had documentary inserts featuring interviews with famous writers and artists from Superman's history. The BBC Radio full-cast drama features Adam West, Jenette Kahn (President, DC Comics) and Dave Gibbons (Co-creator, "Watchmen"). The main cast includes Stuart Milligan as Superman, Shelley Thompson as Lois Lane, William Hootkins as Lex Luthor and Bob Sessions as The Batman. Written to celebrate Superman's 50th birthday. Accused of crimes against humanity, the Last Son of Krypton stands powerless before a court dominated by Lex Luthor - criminal genius turned Prosecutor. Has Superman really corrupted our children? Can he justify his continued interference in world affairs? Do we know the truth about his powers? Can Lois Lane defend '50 years of the Man of Steel'? The program runs for 45 minutes (approx). 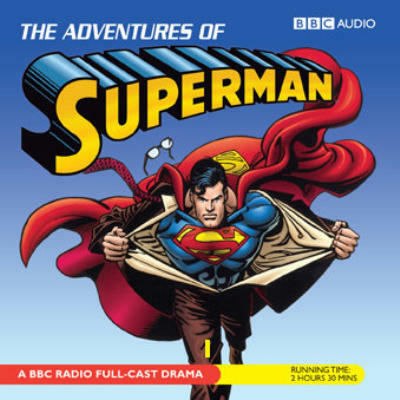 The Adventures of Superman radio program is based on original post-Crisis DC Comics material, and features a star cast. Recorded in Dolby Surround with spectacular sound effects, the program also boasts a thrilling specially composed orchestral score. "A supersonic passenger aircraft on its maiden flight collides with a private plane over a packed Metropolis airport - and is saved from destruction by a mysterious flying man..."
From Superman's very first deed of daring to his battle of wits with evil businessman tycoon Lex Luthor, The Adventures of Superman tells the story of The Man of Steel from the beginning - of his love affair with Lois Lane, his friendship with Jimmy Olsen, and his battle with not only Lex Luthor but also The Bizarro Superman and Metallo, the cyborg with a kryptonite heart. A movie without pictures - you won't believe your ears! David Bannerman, Vincent Brimble, Sue Broomfield, Nigel Carrington, Terence Edmond, Christopher Good, Ronald Herdman, Norman Jones, Joanna Mackie, Dale Ropley, Jane Whyttenshaw, Andrew Wincott. The program runs for 2 hours and 30 minutes. Doomsday and Beyond radio program features a star cast, incredible sound effects, and a full orchestral score, this program recreates the world of Superman direct from the pages of DC Comics and, in Dolby Surround, you are in the thick of the action!. "The Death of Superman - and his Return!" Epic action, thrilling suspense, and a rollercoaster ride of mounting excitement are all featured in this incredible audio experience, chronicling not only Superman's duel-to-the-death with the monster called Doomsday and how he ultimately returned, but also the story of his love affair with Daily Planet reporter Lois Lane and the true fate of his arch-enemy, Lex Luthor. The fastest-selling comic book story of all time comes to life like nothing you've ever heard before! The program runs for 2 hours and 35 minutes. REVIEW: In 2005 this Audio Drama was re-released by Time Warner Audio Books on CD under the title "Superman Lives!". Purchase this CD from Amazon.com. Read our review of this CD. There are actually two versions of "The Adventures of Superman", both with the same cast, but subtly different. One was broadcast in five-minute chunks on BBC Radio 1, and the other in half-hour episodes on BBC Radio 4. Maggs also produced two Batman radio programs: The Lazarus Syndrome (an original adventure featuring Ras Al Ghul), and Knightfall, an extremely faithful adaptation of the DC Comics storyline of the same name. Covers of the BBC Radio Collection Cassettes. Thanks also to Chris Halliday for added information.